As Valentine’s Day approaches, love is in the air – along with a certain degree of panic. No matter how predictably it falls on the calendar every single year, rooted to the same date of February 14th, it always seems to sneak up on romantics nationwide. Even the most prepared love-struck partners have been known to struggle with the deadline, since life has been known to intrude at the most inopportune times. No matter the time constraints, rekindle genuine romance at the drop of a hat by pulling this shortcut recipe for sweet cheesecake-stuffed strawberries out of your sleeve. Far better than flowers or store-bought chocolates, nothing shows your love better than a homemade gift like these vegan cheesecake-stuffed strawberries. Sure, simple chocolate-covered delights are nice enough, but by going to extra mile and filling them to the brim with creamy cheesy custard, this tried-and-true aphrodisiac is transformed into a truly memorable treat. It doesn’t take much effort to show loved ones just how much you care, especially when you say it with food! 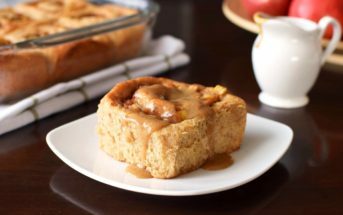 By ingredients, this recipe is dairy-free / non-dairy, egg-free, optionally gluten-free, optionally nut-free, peanut-free, optionally soy-free, vegan / plant-based (see graham cracker note), and vegetarian. Graham Crackers – There are many dairy-free brands out there (like Erewhon Organic Graham Crackers and Enjoy Live Vanilla Graham Cookies), but strict vegans should take note that honey is a common ingredient in graham crackers. For strict vegan cheesecake-stuffed strawberries, look for honey-free brands, like Sweet & Sara, swap in some other vegan crushed cookies, or even make your own grahams! And yes, gluten-free grahams do exist! To make gluten-free cheesecake-stuffed strawberries, use a brand like Kinnikinnick’s S’moreables, Enjoy Live Vanilla Graham Cookies or Schar Honeygrams. Of course, these vegan cheesecake-stuffed strawberries will be delicious even if you have to skip the graham cracker finish! Dairy-Free Cream Cheese Alternative – There are now many brands on the market to choose from! Daiya is the only soy-free and top allergen-free one that we know of, but Tofutti (yellow package for non-hydrogenated), Go Veggie (vegan, purple packages), and Follow Your Heart have accessible options, too – all in 8-ounce refrigerated tubs. Some even have strawberry versions if you want to double up the fruity goodness! If your feeling a little nutty, make your cheesecake-stuffed strawberries with a homemade soy-free cashew cream cheese. Be sure to select large, plump strawberries to ensure a good ratio of fruit to cheesecake to chocolate in every bite. Wash and very thoroughly dry the strawberries. Use a sharp paring knife to slice off the stem and attached leaves on each strawberry. Carve out the center carefully, removing the core and a little bit around it to accommodate the filling. In a mixing bowl, beat the cream cheese alternative, sugar, vanilla, and zest with a hand mixer until completely smooth. Transfer the dairy-free cheesecake mixture to a pastry bag or a zip-top bag with the corner snipped off, and carefully pipe the filling into your prepared, hollowed out berries. Mound it slightly over the top of each strawberry for the most visual impact. Once all strawberries are filled, set out a sheet of waxed paper nearby and melt the chocolate with the coconut oil. Gently dip half of each strawberry into the liquid chocolate. Allow the excess coating to drip off before carefully placing the chocolate-covered berry on the wax paper. Repeat until all the berries are all half-dipped. Let the chocolate-covered strawberries set up in a cool place. Sprinkle the graham cracker crumbs lightly over the dairy-free cream cheese mixture to finish. Refrigerate berries until ready to serve; best if served within six hours. These strawberries look amazing. 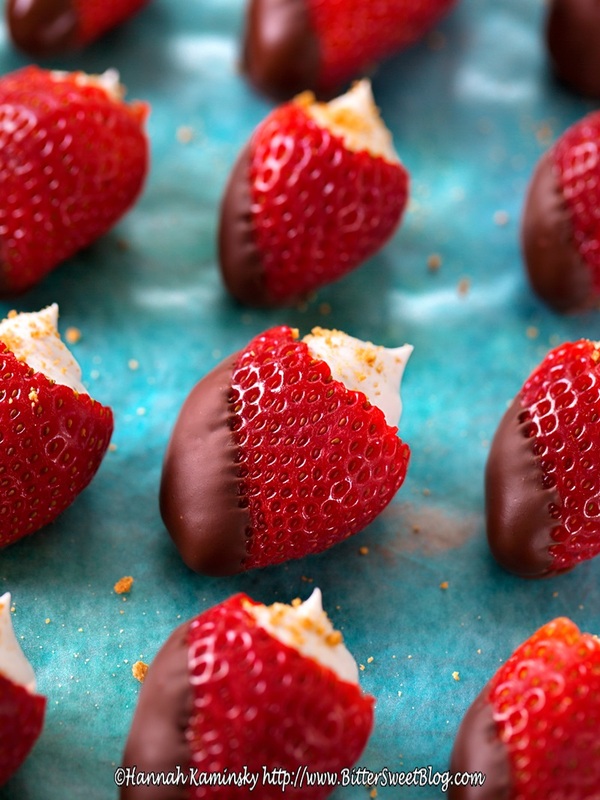 I’ve filled strawberries with mousse and cheesecake, but I’ve never dipped them in chocolate after. I need to get on that. Indeed, they are very fun to make! Another amazing strawberry dessert! I’m loving these 🙂 And yes, I most certainly am pinning it all over the place! 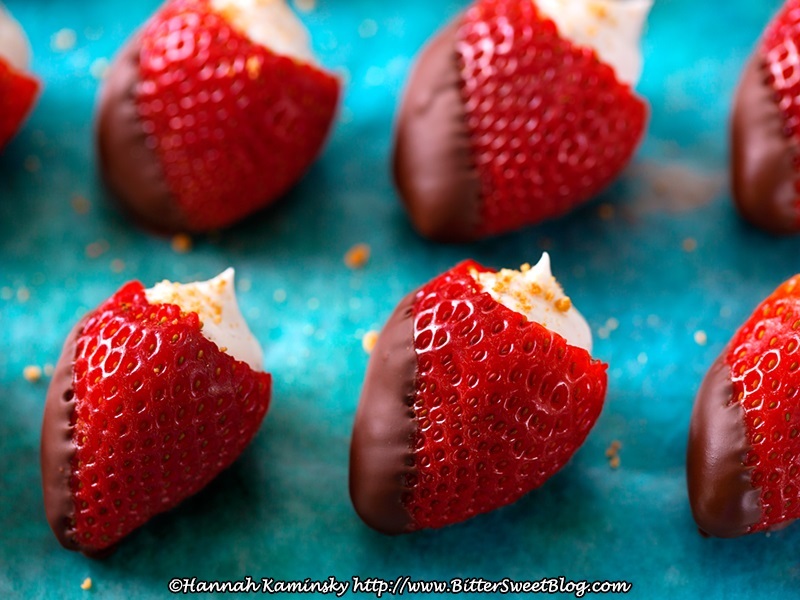 I’ve made chocolate dipped strawberries, many times, but never ones stuffed with cheesecake! They sound amazing! I love how you listed so many options for people with different dietary restrictions in this recipe. The strawberries sound wonderful! I love the understated beauty of these strawberries! 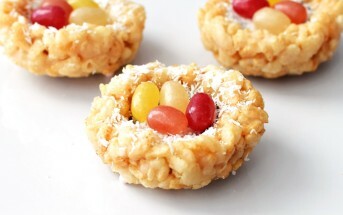 Plus, love that they are vegan – perfect treat. These strawberries look terrific! I appreciate the wide variety of allergen-free options you’ve provided, and the sprinkle of graham cracker crumbs is just the sweetest. I agree with Shirley – chocolate dipped strawberries are already just simply perfect, but adding one of my favorite desserts like cheesecake to them? sublime! Oh wow, I am so impressed with how beautifully these were able to be stuffed! Thanks so much for also providing the dietary options!